A few months ago FoxT made their official announcement regarding the EOL-ing of various BoKS versions within the next 1.5 years. Per the 31st of December 2010, the following products will no longer receive support. Also, per the 31st of December 2011, the following products will no longer receive support. Per the aforementioned dates "no more maintenance updates or patches will be made available and no further development will take place for these particular components. In addition, the affected components will no longer be supported by FoxT Customer Support". Please keep these dates in mind and plan your upgrade paths accordingly! You don't want to get stuck with an unsupported version of the software because you'll miss out on critical software updates and tech support costs will go through the roof. Then again, in this day and age, why are you still running a version < 6.0?! I sincerely have the utmost faith in digital content delivery. Over the past year we've seen a huge rise in sales of e-readers, which is a great step forward. But we're not there yet! Call me an Apple fanboy if you will, but I do believe the iPad is the next step and who knows what the future will bring after that?! I hear good things about e-ink color screens! Either way, those things are simply used to carry and present the important bit: content. And how does it get on there? Delivery through the Internet! So far it's working wonderfully on my iPhone. I've been using Comixology's Comics to both purchase and consume comic books. The buying process couldn't be simpler and IMO pricing is very fair. Most comics ring in at 0.79 euros, with the more popular Marvel comics running 1.59 euros. Choose comic, enter password, download, read. It's wonderfully easy and the Comics app has opened my eyes to a lot of new comics. One of my new favorites is Fearless Dawn. On a more serious note I'm loving PressReader, which gives you access to 1000+ international news papers. And I don't mean an aggregation of their online content, but the actual full PDFs of each news paper. 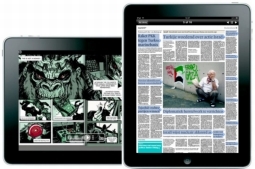 The application itself is free and comes with seven free issues of any paper of your choosing. The economy subscription to PressReader runs $9.95 and gives you access to 31 issues each month, allowing you to mix and match any papers you would like. There are also more expensive subs, or you can pay as you go at $0.99 per paper. The economy sub is actually cheaper than most of the online-only subscriptions to dutch news papers. PR gives access to the Volkskrant and the NRC, both of which have a more expensive online-only sub. Only NRC runs cheaper, but only if you pay per-year instead of per-month. Either way, I love reading the paper through PR and assume that it'll only be nicer on the much bigger iPad screen. Personally I'm sold on on-demand content delivery through the Internet. I had no clue what'd gone wrong. Sure, I'd talked too fast cutting the presentation short. And yeah, one guy'd told me it was a borderline sales pitch. But overall I thought things'd gone pretty well and I'd gotten some positive reactions!